"The more questionable the ripeness of the bananas, the better", writes Vicky in her dough-lightful cookbook. The reason being, she goes on to say is that "you want them to be super overripe and gooey to make the cake mixture extra yum." Well, we can't argue with that, can we? 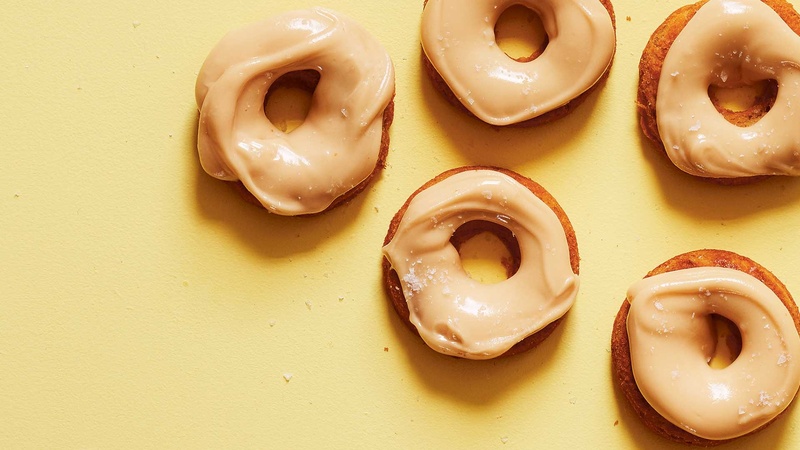 For more excellent tips on how to achieve the perfect doughnut at home, check out her cookbook Donuts, published by Hardie Grant. Preheat the oven to 180°C and liberally grease a 12-hole donut tin with butter. Cream the butter and sugar until pale and fluffy and add the eggs, one at a time, adding 1 tablespoon of flour each time. Fold in the remaining flour, baking powder and the mashed bananas. Pour the mixture into the donut tin, filling each hole around two-thirds of the way up. Bake in the oven for 12–14 minutes, until a skewer or cocktail stick inserted in the centre comes out clean. Leave to cool before transferring to a wire rack. To make the icing, combine the icing sugar and maple syrup and mix until smooth. Spoon the glaze onto the cooled donuts and return to the wire rack to set. Sprinkle with sea salt flakes to finish.